Been wanting to get Invisalign since forever & now I've finally just started my first set! I'm getting my Invisalign done at West Coast Dental! And no, it's not located in the West haha. They do have 2 outlets there, at West Coast Plaza & Bukit Timah Road, but I go to their newest outlet at Marina Square, which is much more convenient for me since I live in the North/Central area. They're very busy at their 2 West-side clinics with waiting times of up to 2 hours, so the newest outlet at Marina Square is to cope with the increasing demand & especially for people who don't want to travel all the way there! It'll be very convenient for those working in the city area. 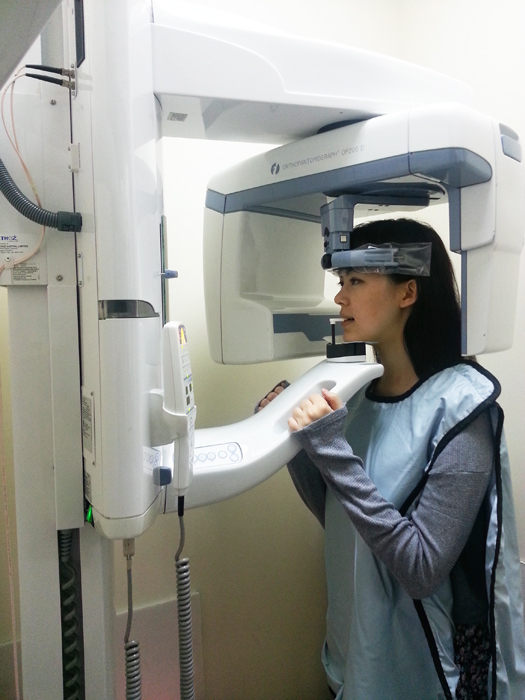 For the first visit I actually thought it would just be an all-talking consultation, just see-see my teeth & so on. That's why if you see my pictures below... I didn't even bother wearing contact lens. I rolled out of bed & went to the clinic lol. This is because... West Coast Dental isn't the first clinic I've gone to keen to do Invisalign. I actually went to another one last year, but they were really unprofessional & it stopped there. Won't name them outright but initials are T.A. & located in the city/Central area as well. At T.A., they made me go for 3 VISITS & there was NO progress. First visit, talk talk blah. 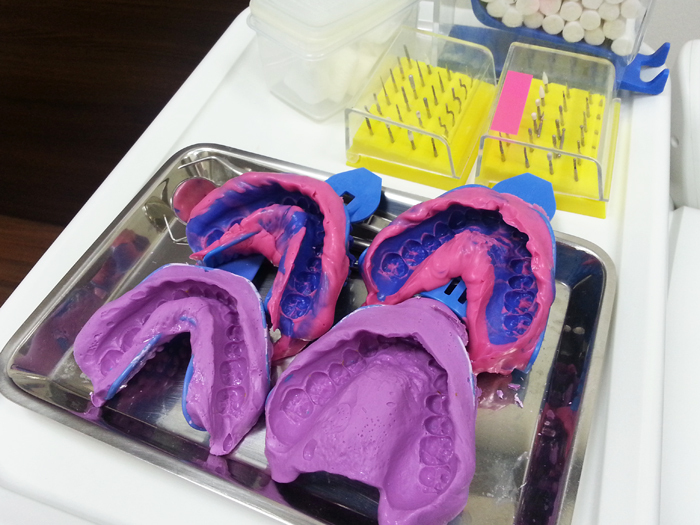 Second, take moulds for the aligners. Third, for nothing?! They basically asked me to go down after work, just to tell me that, Oh yeah we've got the moulds of your teeth, should be preparing the aligners soon. MY TIME FREE IS IT?! Was really pretty annoyed at all the inefficiency. 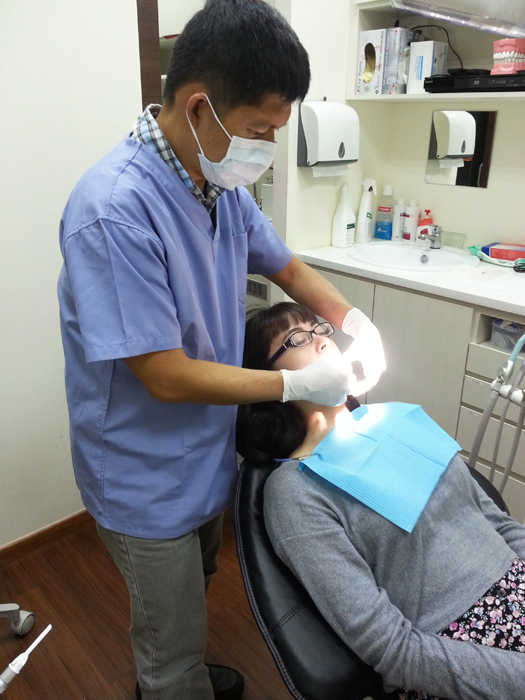 Here's Dr Lim getting the moulds of my teeth! And so here are the moulds of my teeth from which they'll make the aligners! I know they say teeth cleaning should be done once a year or something like that but... I can I do it more often?! The feeling is awesome! You'll be like... "wtf I never knew there were gaps between my teeth". I mean of course you knew, but you never felt them so distinctly with your tongue. I haven't explained at all what Invisalign is but I think by now everyone has a rough idea right? It's basically completely transparent & works in a similar way to braces, except that they're not glued to your teeth since you can remove them to eat, brush your teeth & change to a new set! Each set is worn for approximately 2 weeks & then you change to a new set. Thus each set progressively moves your teeth more & more towards the desired outcome, in a similar way to the regular tightening that has to be done with braces. The main difference is that Invisalign is completely INVISIBLE, whereas braces are extremely conspicuous. I wore braces for a year when I was 12 years old, but my teeth shifted so much in the next 10+ years because I wasn't given retainers to wear (which keep your teeth in position). Now that I look back on it, I realise I was basically scammed. I had no tightening done & no retainers. I basically wore an ugly wire on my teeth for a whole year for nothing. My first box of aligners! This contains 2 sets, meaning they'll last me for a month. The cases the aligners come in! It's important to keep them in their cases at all times (Xiaxue was very, very strict in lecturing me about this haha) because it's extremely common to accidentally throw away your aligners when you place them on tissue/by your plate/on your food tray/etc! Trying on the aligners for the first time! Very easy to put on & take off! The black words on the aligners will say something like, U 01, which means Upper Aligner #1! But it's impossible to mix up your aligners (between top & bottom at least) cause they're just too different since they're unique to your upper/lower teeth at that precise moment. Whether it's possible to mix up aligners between weeks... That one I dunno & don't intend to try lol. With Dr Lim & Candy, who will be responding to consultation queries! By the way... I haven't mentioned that there's a TV in front of your seat to keep you occupied haha. After all, it's pretty boring to just sit there. I wish hair & nail salons would all implement this too! On my first visit I remember they were screening Ice Age 2 but can ask them to change/start over! 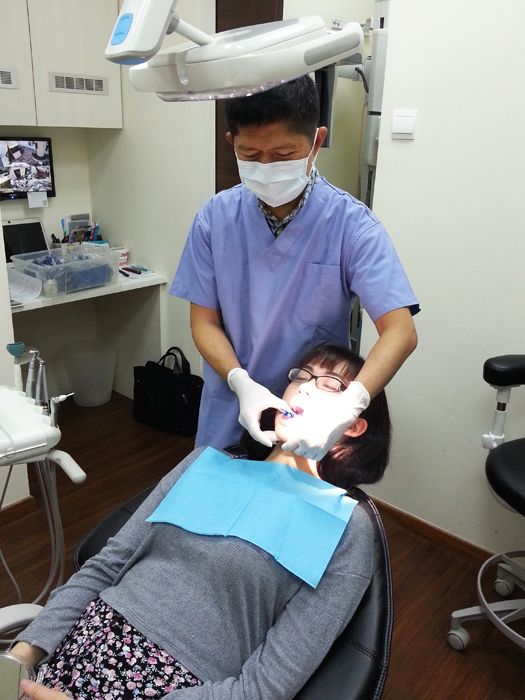 With Dr Lim again, the main dentist at West Coast Dental! 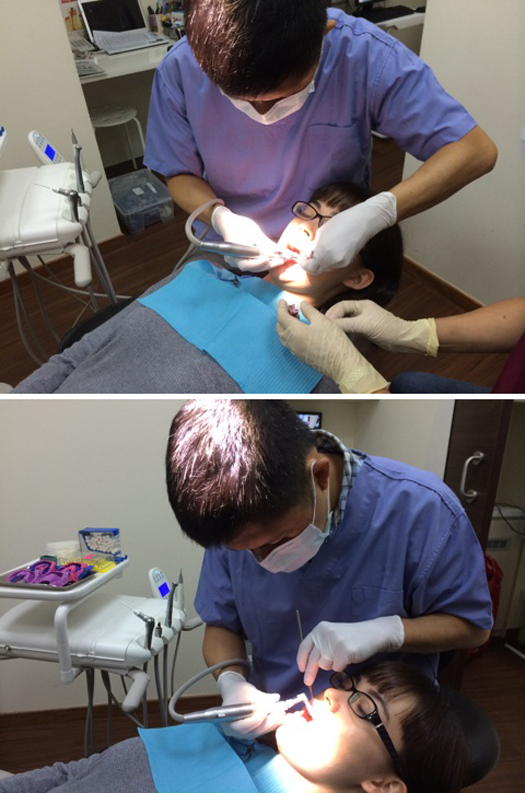 He graduated from NUS Dentistry & has been practising for 24 years. He's very popular with his clients & I can see why! He's very gentle & very approachable & will explain things simply for you. West Coast Dental at Marina Square! The first time to West Coast Dental at Marina Square might be a bit confusing because Marina Square is so big & walk one end to another like can die one.... I don't really know how to explain it but I knew the area because I always identified this section to have more aesthetic services such as slimming, nail salons & waxing parlours than others. Follow directions ok? See the mall directory. Or you can call the clinic if you get lost! I don't know if anyone noticed that I smile with my mouth closed ALL THE TIME. I used to smile with teeth, but at some point (around 2 years ago) I noticed my teeth were shifting & I became really self-conscious because I felt they were so obvious in pictures. And let me tell you... it's impossible to Photoshop bad teeth! My bottom actually looks okay when you see it on its own. AND THE MAIN PROBLEM IS THIS. When I close my gums, part of my bottom row overlaps the top row wtf! My upper row USED to overlap the bottom fully (which is correct) but slowly it became like this wtf. TEETH, U THINK VERY FUN TO KEEP MOVING IZZIT?! And the worst part was that because I could no longer bite down in the same way, my lower jaw had to move forward to accommodate the new overlap. Which means... MAKE MY JAW LOOK EVEN LONGER & POINTIER %#&^@^$. Teeth, you will be the death of me. Trying on the aligners myself! Here's my teeth close-up. Still not really visible! Only if you look reallyyyy closely (which would be kinda creepy) can you tell there's a clear layer over the teeth, but otherwise it's inconspicuous. I've had my aligners for almost a week now, & no one noticed I had them till I removed them for meals! P.S. By the way I thought maybe I was over-stressing things about my teeth shifting but I casually mentioned it to Qiuting & she was totally like YAH I can see it in all your pictures. So since then I stopped showing my teeth lol. Onwards to a nice smile! * Personally I should be wearing Invisalign for 7 months, but it will differ from person to person. * My teeth felt achey for about 2 days, but it was frankly nothing compared to the first day of braces. I remember they hurt so bad I had problems eating & sleeping. * YES you must be disciplined & wear them as much as possible! It's recommended to wear them for 22 hours a day. Just keep telling yourself the more you wear them now, the faster you'll be done with them! When I was tempted to take them out due to the ache, I told myself that if I did that it's just dragging out the achey feeling. Better 2 days of moderate ache than 7 days of ache-a-bit-here-there. Plus the more you wear them, the faster your teeth will be shifting to their rightful positions! Quote my name to get a special rate when you do Invisalign with West Coast Dental! For the months of August & September, CONSULTATION IS FREE. It's the best occasion to get all your questions answered as well as a quote on your teeth! Contact 90303196 to arrange a consultation! P.P.S. Thanks to Xiaxue for the recommendation! I don't think I've ever seen your teeth. You look prettier. I notice that you always smile with mouth closed.. Thanks for the timely post. Needed good dental contacts though it is odd the clinic does not have a landline and all calls to it went unanswered. Also noticed Xiaxue's previous posting and recommendation was on Orchard Scotts Dental for the same service. Not sure if there's any difference between the two recommended contacts. The clinic does have a landline (available on their website + FB), but I didn't post it up as they preferred to have calls about consultations redirection to the mobile number instead. Is that the mobile number you called? I don't think there's any major difference between dental clinics as long as both are reputable. The next main difference would usually be price & things like service. I have never been to OSD so I can't comment. Well yes. I had called the mobile number listed and was only recently able to get through to a staff member. Now in the process of arranging an appointment. Hope the follow-up will turn out well. Separately, just to also say that I thoroughly enjoy reading your blogposts though I am rather new to it. Your sharing of random thoughts, musings and sentiments especially while still a student were rather poignant, and at times humorous. It was an engaging read. You are an awesome blogger - one with natural beauty, intellect, articulate, yet genuine and very unassuming. Do keep your posts coming! Ehh, I naturally prefer smiling without teeth leh. But my friends are always "wah, so fake." Lol. FML.